"This live album from 1985 highlights the reasons for their success (not least Maurice Lennon's Dynamic fiddle and Mike Hanrahan's catchy songs)"
Throughout the Eighties Stockton's Wing were labelled Pop, Rock, Folk, Trad, Celtic Fusion (and a lot worse) by different publications, but the tens of thousands who attended the almost 1500 performances across Ireland, the UK and America, Stockton's Wing just meant good music and a great night out. 'Stockton's Wing Live - Take One' captures that feeling. Produced by their good friend Bill Whelan, who later achieved major success with Riverdance, 'Stockton's Wing Live - Take One' will without doubt bring back many memories of their youth, to many now forty something's. The album, which has been digitally remastered for this release, also includes 3 bonus studio recordings of the band from the same period. "Stockton's Wing rendered the hoariest of western folk traditions with an urgency and vitality every bit as strong as another Irish band, U2." "As folk musicians, the band has virtuosity to spare - particularly fiddler Maurice Lennonand flautist Paul Roche." Jon Pareles, New York Times. From their inception in 1977 Stockton's Wing were one of Ireland's leading live acts with their infectious blend of Pop, Rock and Traditional Irish music. While the band was formed by a quartet of All-Ireland champion musicians in Maurice Lennon (fiddle), Paul Roche (flute), Kieran Hanrahan (banjo) and Tommy Hayes (bodhran), it was the introduction of Singer/Songwriter Mike Hanrahan in 1980 that shifted the emphasis from straight traditional music to a mix of fiery traditional sets combined with original songs and instrumentals. Throughout the 1980's they toured extensively, not only on the Irish circuit but also in America, Canada, Europe & Australia. In the summer of '88 they shared the stage with Michael Jackson in Cork. The following year they appeared with the late Sammy Davis Jnr. in Dublin as part of his world tour with Frank Sinatra & Liza Minnelli. In 1990 they went on location to perform in the film production of the John B. Keane play "The Field" with Oscar nominees Richard Harris and John Hurt. 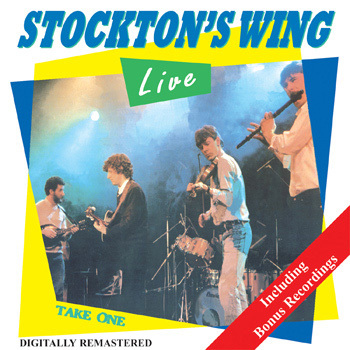 STOCKTON'S WING - Live - Take One Tara Music TARACD 4016 12 tracks, 45 minutes Originally released in 1985, this CD version will delight Stockton's Wing fans and newcomers alike. Perhaps one of the most curious bands of the 70s and 80s folk revival, and certainly one of the most puzzling names, Stockton's Wing managed to bring Irish music and pop/rock together without compromising their traditional credentials. As a result, a whole generation of young Irish musicians grew up playing the old tunes in a new way. For folkies, they represented the acceptable face of rock music. For trendies, they lent some street cred to Irish music in the days before street cred was invented. For me, they were and are a bunch of white-hot musicians who recorded some ground-breaking albums - and Live - Take One is no exception. Kieren Hanrahan, Paul Roche, Maurice Lennon and Tommy Hayes all had All-Ireland titles under their belts. The addition of singer Mike Hanrahan produced a supergroup with real Celtic fire in its belly. The influence of their songs and instrumentals alike was enormous: Beautiful Affair, Walk Away and In Our World are still requested wherever forty-somethings gather to drink porter. Skidoo and The Chicago Reel set a standard which endures to this day. Listen to The Golden Stud or Silent Dreams and you'll hear the forerunners of Riverdance, created by the man who produced this album. In many ways, Stockton's Wing have never really gone away: they just keep organising reunion concerts! Those of you who still have the LP will notice that the CD version is longer by ten minutes and three tracks. Tara have added studio versions of Sally Lennon's, In Our World and The Mason's Apron as bonus tracks. The energy level is almost as high as in the live act, and it's fascinating to hear the crystal clear recording. I'd still have preferred Tara to squeeze two albums onto the CD, but that's commercial reality for you: take it or leave it. "A great CD with a good mixture of instrumental and vocal tracks. I throughly enjoyed the CD. The four young men are very good instrumentalists and play an interesting range of instruments. The beat is strong without being over powering, and the vocals are clear. The arrangements are modern but keep the message going. Track 2 Walk Away is a real toe tapper which would help to raise the spirit if needed. Mason's Apron also has a good strong beat a must for dancers. Track 5 Beautiful Affair is a vocal, it is sung with sensitivity but with a modern beat. This is a CD I will definately listen to again and again, it's refreshing, bright and lively and should be a great hit with all ages."